For other uses, see Pus (disambiguation). 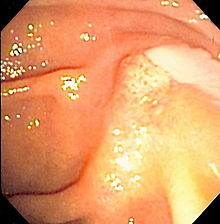 An abscess is an enclosed collection of pus. Pus consists of a thin, protein-rich fluid, known as liquor puris, and dead leukocytes from the body's immune response (mostly neutrophils). During infection, macrophages release cytokines which trigger neutrophils to seek the site of infection by chemotaxis. There, the neutrophils release granules which destroy the bacteria. The bacteria resist the immune response by releasing toxins called leukocidins. As the neutrophils die off from toxins and old age, they are destroyed by macrophages, forming the viscous pus. Bacteria that cause pus are called pyogenic. Although pus is normally of a whitish-yellow hue, changes in the color can be observed under certain circumstances. Pus is sometimes green because of the presence of myeloperoxidase, an intensely green antibacterial protein produced by some types of white blood cells. Green, foul-smelling pus is found in certain infections of Pseudomonas aeruginosa. The greenish color is a result of the bacterial pigment pyocyanin that it produces. Amoebic abscesses of the liver produce brownish pus, which is described as looking like "anchovy paste". Pus from anaerobic infections can more often have a foul odor. In almost all cases when there is a collection of pus in the body, the clinician will try to create an opening to drain it. This principle has been distilled into the famous Latin aphorism "Ubi pus, ibi evacua" ("Where there is pus, evacuate it"). Staphylococcus aureus bacteria is the most common cause of boils. ^ "Pus". dictionary.reference.com. Retrieved 2008-08-18. ^ "Pus – What Is Pus?". medicalnewstoday.com. Retrieved 2016-08-19. ^ Barer, M.R. (2012). "The natural history of infection". Medical Microbiology. Elsevier. pp. 168–173. doi:10.1016/b978-0-7020-4089-4.00029-9. ISBN 978-0-7020-4089-4. ^ Topazian RG, Goldberg MH, Hupp JR (2002). Oral and maxillofacial infections (4 ed.). Philadelphia: W.B. Saunders. ISBN 978-0721692715. ^ Thompson, Alexis; Miles, Alexander (1921). "Pyogenic Bacteria". Manual of Surgery (6th ed.). Oxford Medical Publications. OCLC 335390813. ^ a b c Nuland, Sherwin B. (2011). Doctors: The Biography of Medicine. Knopf Doubleday. ISBN 978-0-307-80789-2. ^ Van Hoosen, Bertha (Autumn 1947). "A Woman's Medical Training in the Eighties". Quarterly Review of the Michigan Alumnus: A Journal of University Perspectives. University of Michigan Libraries: 77–81. UOM:39015006945235. ^ Scott, William (1922). An indexed system of veterinary treatment. Chicago: Eger. p. 603. ^ a b c Schneider, Albert (1920). Pharmaceutical bacteriology (2nd ed.). P. Blakiston. p. 247. ^ Williams, Charles J. B. (1848). Principles of Medicine: Comprising General Pathology and Therapeutics, and a Brief General View of Etiology, Nosology, Semeiology, Diagnosis, and Prognosis: With Additions and Notes by Meredith Clymer. Churchill. p. 306.